Beat eggs, salt and water. Melt butter in 10-inch skillet over medium heat. Cook potatoes, zucchini and tomato in butter, stirring occasionally, until hot. Pour egg mixture over vegetable mixture. As mixture begins to set at bottom and side, gently lift cooked portions with spatula so that thin, uncooked portion can flow to bottom. Do not stir. Cook 3 to 5 minutes or until eggs are thickened throughout but still moist. 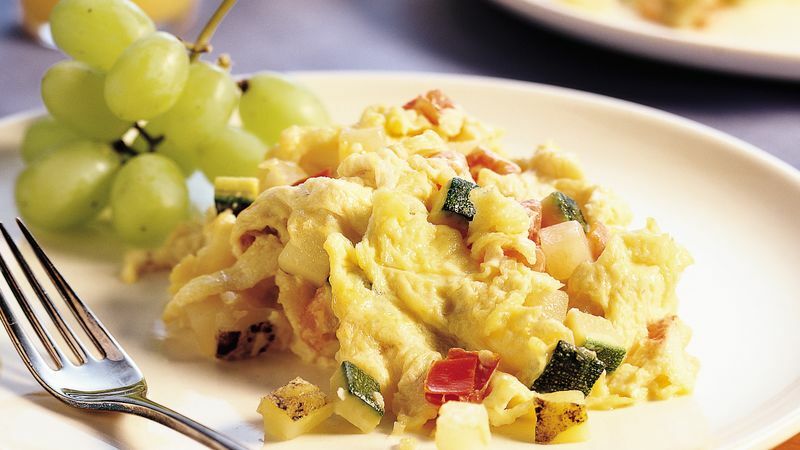 Do your scrambled eggs end up looking more like rice or peas than the fluffy, moist thick eggs from a restaurant? The trick is to stir them as little as possible while they cook.